Original X-Force and current X-Factor member Julio Richter possesses the mutant ability to unleash seismic energy, causing violent vibration and even earthquakes. 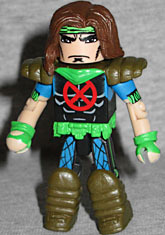 This is Rictor's '90s costume, so he looks like a 1980s rock musician. His long brown hair is a new piece, and it effectively keeps his head from turning. He has a green headband painted on, and a green scarf that's part of his giant shoulder pads. Then there are short blue sleeves with green fringe, fingerless green gloves (with rolled cuffs), a black shirt with a big red X on the chest, a needlessly complex green belt, black pants with weird blue panels on the front of the thighs, and huge brown boots. What a mess! With the ability to create time bombs of exploding energy, Tabitha Smith has been recruited to several superhero teams, most prominently the mutant strike team X-Force. Boomer - whose first supranym was "Boom-Boom," so this was a lateral move at best - is basically a white trash Jubilee. Not "a white trash jubilee" like the Gathering of the Juggalos, but like Jubilation Lee from a trailer park. Except Boom-Boom's powers work better. Anyway, she's wearing a ghastly pink and yellow outfit with "BOOMER" down her left leg, huge shoulder pads, fancy gloves, and the same ornate belt Rictor was wearing. 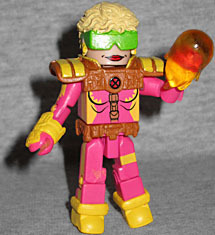 Her hair is new, with built-in goggles hiding her eyes and "explosion" earrings. She gets two orange energy balls for her fists. While it may seem that this set adds two more mutants to the X-Force team, that's not quite true. These two are wearing their Greg Capullo-designed costumes, which means the only one who really goes with them is this Cable - everyone else is in their Liefeld outfits.